Set the intestines under the faucet and wash them with cool water to remove salt from the insides and to hydrate. Let intestines soak in some water with 3 tablespoons of lemon juice for about 15 minutes while preparing the other ingredients. In a small pot, cook the chopped onion, garlic, bay leaf and wine together for 5 minutes until the onion is transparent. Remove the bay leaf and let the mix cool. In a medium-sized, deep container, mix the pork, beef and bacon. If possible, wear gloves and use your hands to combine the meats. Add the seasoning and salt and pepper to taste, along with the onion mix, and combine all ingredients. Drain the intestine and dry with a paper towel or paper napkin. Cut the intestines in two. Put the chorizo (sausage meat) mix in a churro maker or pastry sleeve. At one end of the intestine use cooking twine to make a knot and synch the end closed. At the opposite end of the intestine, insert the churro maker or pastry sleeve and fill the intestine, using your hands to push the meat from one end of the intestine to the other, eliminating any air bubbles or pockets. Once the intestine is filled, tie off the other end with the cooking twine, making sure the chorizo mix doesn’t spill out. Run the stuffed intestine under the faucet to eliminate any meat residue. Measure out 4-5 inches along the length of the intestine and twist the intestine with your hands to form 1 chorizo. Repeat for the entire length of the intestine to make the individual chorizos. If you prefer to tie-off the chorizos using cooking twine, tie-off one end using the twine, measure out 4-5 inches and tie a knot using more cooking twine to close-off, or form, one chorizo. Repeat to tie-off the second, third and all other remaining chorizos until you reach the other end of the intestine. Pinch each chorizo with a needle to remove any air. Store the chorizos in the refrigerator if you plan on using them within the next 24 hours, or package and freeze them to cook up later. Allowing the chorizos to sit for at least 24 hours after preparing them will allow the flavors to mix and concentrate. Completely thaw out the chorizos to room temperature before roasting in the oven, frying or grilling them. Greasing up the cooking twine with lard makes it easier to tie the knots. Following these same steps of preparation, try making chicken or turkey chorizos, or sausages made of other meats, and try adding other herbs. Since I was a child, I enjoyed Sunday cookouts at home. Luckily, in my dear Venezuela, parrillera (grilling) culture is an important tradition. It’s common to get together for no special reason during the weekend or any other day off, to prepare a rica parillada, accompanied with delicioso picadillo (similar to hash), guasacaca (an avocado-based sauce), jojotos (corn on the cob), fried or boiled yucca, sometimes morcilla (blood sausage) and of course… chorizos (sausages)! There’s a large variety of chorizos available in Venezuelan butcher shops: chorizo español (Spanish sausage), criollo, chicken chorizo and many other kinds that are too numerous to mention. Since living in the United States, in my usual effort to investigate and prepare recipes from almost all cultures, and especially those of Latin America (since these recipes are characterized by their concentrated saborcito criollo), I have begun to perfect certain recipes. Today, I dare share with you one of my homemade recipes to enjoy at a good parrillada (cookout). 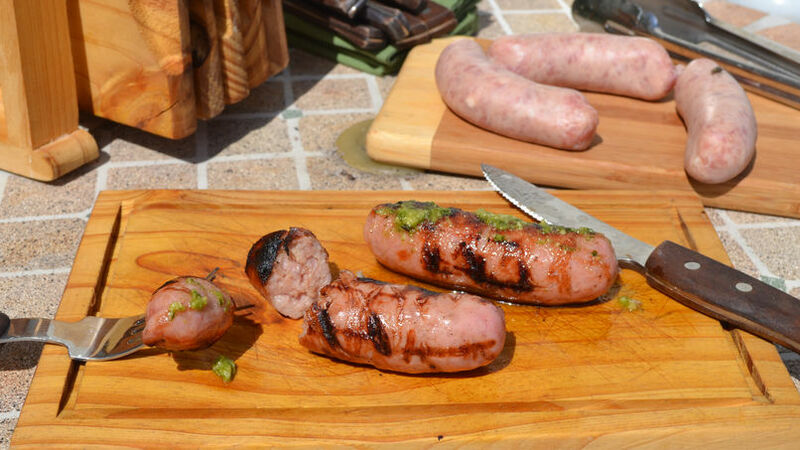 This recipe is for chorizos criollos parrilleros! Chorizo criollo (criollo sausage) is known for its mix of ground pork and meat, seasonings and spices, and bacon, which gives it its final toque of flavor. You can grill, fry or roast them. Dare to try preparing and stuffing these chorizos criollos to present at your next parrillada… and remember to make enough, because I assure you, your dinner guests will want seconds.